STRASBOURG -- EU lawmakers backed a target to cut carbon dioxide emissions from cars and vans by 40 percent by 2030 in a vote on Wednesday that will set the stage for a battle with national governments. Parties in the European Parliament struggled until the final hours before the vote on how tough to make the curbs on one of Europe’s most important industries, part of efforts to reduce greenhouse gas emissions. EU lawmakers backed the target, which is tougher than that proposed by the European Commission, by 389 to 239. They also set a 20 percent target for 2025. The parliament’s environment committee, which leans toward tougher action on climate change than the chamber as a whole, last month backed a reduction of 45 percent by 2030 on emissions of automakers' fleets of cars and vans. But the biggest political group, the center-right European People’s Party, did not support that target, concerned it could harm the industry’s competitiveness. Lawmakers had been haggling to reach a compromise before the vote. The executive European Commission’s draft law proposes less exacting CO2 reduction targets of 15 percent by 2025 and 30 percent by 2030 compared with 2021 levels. Wednesday’s vote set lawmakers’ position for negotiations on the final targets with the bloc’s 28-member states, which are still debating their position. Germany, voicing worries that more ambitious climate targets will cost jobs in its big automotive sector, has said it will back the European Commission’s initial proposal. But other EU governments, including France, are seeking a higher target. Volkswagen Group’s admission in 2015 that it had masked exhaust emissions using software in as many as 11 million diesel vehicles worldwide has galvanized EU regulators into setting tougher rules. “Auto manufacturers and certain governments have not learned their lessons from the Dieselgate scandal,” said Karima Delli, chair of parliament’s transport committee. 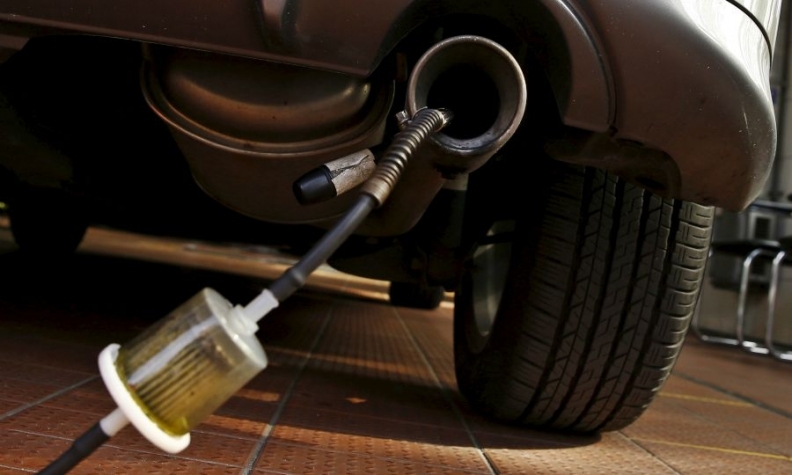 Germany set out its own plans to cut pollution from older diesel vehicles by asking automakers to offer trade-in incentives and hardware fixes. The EU’s new rules aim to help meet the bloc’s goal of reducing greenhouse gas emissions by at least 40 percent below 1990 levels by 2030. They will introduce a credit system for automakers to encourage the rollout of electric vehicles, as well as fines for exceeding CO2 limits. An amendment introduced by lawmakers also adds penalties if manufacturers fail to meet that benchmark. The European automakers’ lobby, however, has said a stricter CO2 target than the 30 percent proposed by the Commission was unrealistic and a threat to the sector’s growth.